This FDA regulation requires that a ‘reason’ for signing be clear on the document or signature. 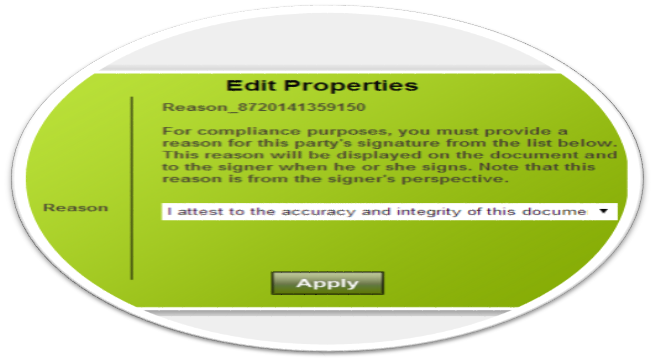 In addition to allowing the signer to choose a reason from a customizable drop-down list, SIGNiX now supports the ability for the submitter to choose a reason for the signer in those use cases where that interaction might be appropriate. New Client Preference for signature auto-advance behavior. Governs how signer will be redirected to next signature upon completion. CC function now supported within MassMailer™. For more information on the MassMailer feature, click here. Note that some features may not be enabled by default, as some features are unique to particular industries and other features may be delayed to allow clients to train their users in advance. Please let your SIGNiX Account Representative know if you would like to access a feature that is not currently displayed in your account. Screenshots in this release note are taken from a pre-production version of the release and thus may be different in the final, production release.